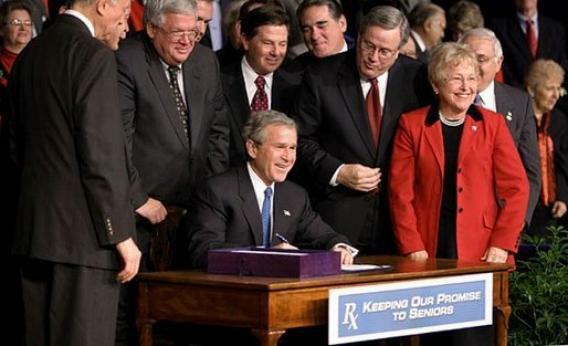 George W. Bush signs the Medicare Prescription Drug, Improvement, and Modernization Act of 2003. In response to Ezra Klein’s piece on the psychology of the GOP flip-flop on individual mandates, Peter Suderman asks if Democrats haven’t flip-flopped on Medicare privatization instead. My view on this is perhaps closest to Brian Beutler’s. The best defense of Republican behavior on this is to distinguish between tactical opportunism and a mostly consistent view that social welfare spending should be lower rather than higher. Politicians often say things that are inconsistent with what they said at earlier points, but the long arc of Republican health care policymaking at the federal level has been to try to spend less money rather than more. Which is why I think the most interesting flip-flop isn’t about Obamacare, it’s about the exceptional moment in 2003 when George W. Bush and the Republican congressional leadership—including current tightwad-in-chief Paul Ryan—whipped votes in favor of what was, at the time, the largest expansion of the welfare state since Lyndon Johnson was in office. That was the creation of a prescription drug benefit for Medicare. The legislation was, in many ways, like something straight out of the D.C. compromise blueprint. The basic idea was to do something Democrats wanted to do—make Medicare benefits more generous. But it was structured so as to be very favorable to pharmaceutical companies and insurance firms. And the pot was sweetened by including substantial money to facilitate seniors opting out of Medicare and into subsidized private plans. Republicans made a giant exception to their aversion to spending money on non-military matters for this, and it wasn’t paid for by offsetting spending cuts or tax increases. Only two Democratic senators ended up voting for it, but at the same time Democrats didn’t filibuster it to death even though they had the votes. When I was originally covering this story, I assumed the bill would never pass. The Republican version of a Medicare benefit seemed to me to be a tactical retreat. Democrats had a much more progressive bill to achieve this purpose, so I thought the GOP had ginned up an alternative to muddy the waters but fundamentally had no particular interest in a very expensive addition to Medicare. But they did. It was a hard lift whipping the votes in the House to pass the thing since many conservatives objected, but they got it done. And in an odd coda, the bill’s passage was integral to the birth of the Affordable Care Act. That’s because the deficit-financed subsidies to private insurers inside Medicare became offsetting spending that Democrats could cut in order to make Obamacare deficit-neutral. If the Bush administration had never created that program in the first place, Democrats wouldn’t have been able to cut it later on and use those savings to finance their own health care bill. They’d have either had to write a much stingier program or else include substantially more in the way of tax hikes. And yet even though the 2003 Medicare bill was controversial at the time, it seems to have basically been eliminated from memory. Now all good Republicans are against spending money on anything, but nobody proposes to repeal the basic benefit. It’s as if the whole thing never happened.